The minimum wage debate is heating up again. On the Left, we have those that think the minimum wage needs to be raised. Those of us on the right, disagree – we either think that the minimum wage is set just fine, or, if you are more honest, would like to see the concept abolished completely. Sadly, the debate doesn’t come down to facts and science. Rather, one side is using populist rhetoric while the other tries and tries to polish an unpopular message that setting a price floor results in surpluses. Listen to the debates and you’ll hear what I’m talking about Just this morning I was listening to The Diane Rehm Show and her panel was discussing the minimum wage. The two supporters of the law invoked such constructs as “The minimum wage hasn’t kept pace with inflation” and “The purchasing power of the minimum wage is lower than it was 60 years ago”. These things, while true, have nothing to do with the debate of whether or not a minimum wage is a good thing. And it doesn’t end there. I’ve heard the debate move into the fact that as the Holiday Season approaches, the republicans actually wanna end unemployment benefits just as people are trying to pay for heat in their apartments. That as the gift giving intensifies, the republicans wanna take away the money that a growing number of people are dependent upon. Again, tugs of populism that have nothing to do with the underlying facts of the minimum wage. 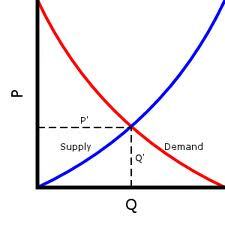 The above diagram is the Supply – Demand curve showing market equilibrium at point P and Q prime; where the two curves intersect. Slide price up and demand is reduced while supply is increased. And if that price happens to be above that market clearing price – you end up with a surplus of the commodity; in this case – labor. This is undisputed. There is no arguing this. So, my conversation In Real Life are beginning to change when it comes to the minimum wage. I’m beginning to point out that minimum wage jobs are NOT MEANT TO SUPPORT A FAMILY. They are, in fact, meant to be transitory jobs that provide employers with inexpensive labor and provide laborers invaluable On The Job Training. Looking further into the data suggests that less than 3% of wage earners make the minimum wage. And of those, a decent number live in a household making the median income. Another aspect of my conversations is this – and it’s critical – it MUST be acknowledged that both myself and my friend I’m debating admit that each of us is acting in manner that we think would benefit the marginal employee; the guy making the minimum wage. Without such acknowledgement we are debating intention and not policy. And when it comes to intention, I have no use for that brand of people who think that I want some people to have a worse life in order that I have a better one. This entry was posted in Economics, Minimum Wage, Politics: National and tagged Diane Rhem, Supply Demand. Bookmark the permalink. If companies are earning excess profit because they can keep the wages very low, and if they still have an interest in keeping production up and earning slightly less profit if they have to pay their lowest wage earners more, then raising the minimum wage would not hurt workers or cause more unemployment. If labor supply is high and thus it is easy to hire more labor at low rates, then increasing the minimum wage would have an overall positive effect on the economy. So it’s an empirical question about the actual state of the labor market. It cannot be answered with abstract economic theory. During the industrial revolution as labor supply was high, sustenance wages could be paid, and workers would have to make their children work to support the family in horrific conditions. Obviously in that circumstance laws to protect workers and limit child labor made good sense in terms of human rights. So maybe the minimum wage should be raised, maybe not. But it’s not a question that can really be answered on ideological grounds, the economic conditions determine the answer. First, what is “excess profit”? Then other companies will come in and take that excess profit. And if they want the best workers, they’ll have to pay those workers more. then raising the minimum wage would not hurt workers or cause more unemployment. The question of “hurt” is open for discussion, but the unemployment will certainly occur. It cannot be answered with abstract economic theory. This is not “abstract economic theory”. This is widely and broadly accepted economic fact that is beyond debate at this point. Obviously in that circumstance laws to protect workers and limit child labor made good sense in terms of human rights. Again, that might be debated. I don’t think that we want kids working in an iron smelting plant, but we may want kids working on the farm. Probably don’t want them working in a slaughter house but working in the deli – why not? So maybe the minimum wage should be raised, maybe not. But it’s not a question that can really be answered on ideological grounds, the economic conditions determine the answer. 1. Admit that employment will be lower than it otherwise would have been. 2. Acknowledge that Unions are driven to raise the minimum wage for selfish reasons. At that point we can begin to weigh the benefits to the people who get/retain their jobs vs the downsides to the people who fail to get/lose their’s. Adding into that calculus are a bunch of other facts such as years lost on the employment ladder, unemployment benefits and so on. Last, this must all be considered within the context that less than 3% of wage earners – WAGE earners, not employees, are earning the minimum wage. And of those, many live in households making more than the median income. Finally, the argument that people can’t raise a family on the minimum wage – or that they can’t afford a two bedroom apartment on the minimum wage is going to fall on deaf ears. Minimum wage jobs are entry level jobs meant to be held while learning a trade, craft or degree. It is NOT MEANT to live on or raise a family on.